Hardwood flooring is expensive. It takes too long to install. Laminate does a good job and it’s much cheaper. All of these are reasons why people shy away from hardwood flooring, but today, our floor store is going to cover why hardwood is an incredible medium to work with. 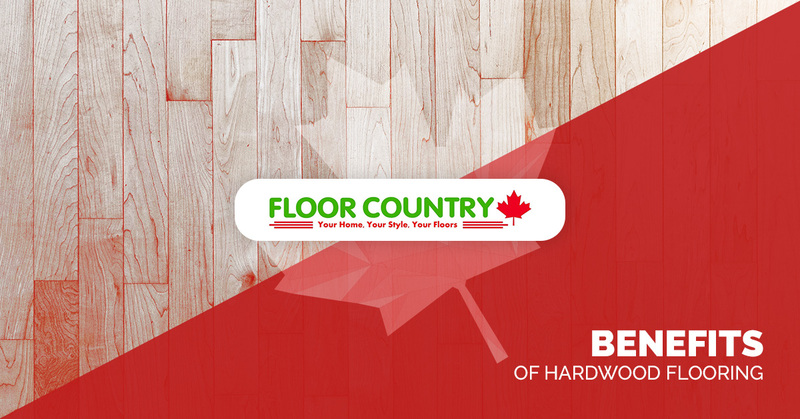 Floor Country is Winnipeg’s premier flooring store of choice. With hardwood, laminate, vinyl, cork, carpet, and tile available, as well as providing floor installation service, we’re your all-inclusive destination for home renovations, builds, and more. Contact us or stop by our shop today! Until then, take a look at these benefits of hardwood flooring. Hardwood flooring is so durable, that for most people, it lasts longer than they live in their home. With proper maintenance and upkeep, it can take a beating and not need to be replaced, unlike other flooring types. It’s true that hardwood flooring is more expensive, but you get exactly what you pay for. Part of the great appeal to hardwood flooring is that it enhances your home’s value. Hardwood is truly an investment, and in many ways, it pays for itself. You can expect a higher listing price when you have hardwood floors, compared to other types of flooring. Hardwood flooring has a look that can’t be beat. Whether for modern or rustic homes, hardwood floor adds character that makes any home look incredible. There’s something charming and comforting about feeling hardwood beneath your feet — it’s a testament to tradition and craftsmanship that continues to withstand the tests of time. With other flooring materials, such as tile or carpeting, there’s a risk for increased allergens in the home. Carpet fibers are notorious for trapping dust and dander (which becomes more of a problem if you have pets). Dust and pollen can also get trapped in grout lines (such as from tile), and irritate allergies. With hardwood flooring you don’t have to worry about consistent allergen issues. Additionally, hardwood flooring offers better acoustics than other floor materials. Sound waves do really well with wood, and this enhances the overall sound quality for any room with hardwood flooring. You don’t have to be a recording artist to benefit from better acoustics — even just day-to-day conversations and sound absorption will be positively impacted from hardwood flooring. Simply by sweeping, vacuuming, and mopping at least once a month, and your hardwood floors will be in good shape! You’ll also want to make sure wood floors aren’t exposed to too much water, as this can cause warping or other damage. But other than that, hardwood floors are meant to be walked on and to take a lot of foot traffic. For a low maintenance floor, hardwood is superior. Available in countless types of wood/species and colors, Floor Country is the place to go for hardwood flooring in Winnipeg. Whether you give us a call of stop by our brick-and-mortar store, we look forward to helping you get the best that this incredible flooring type has to offer!